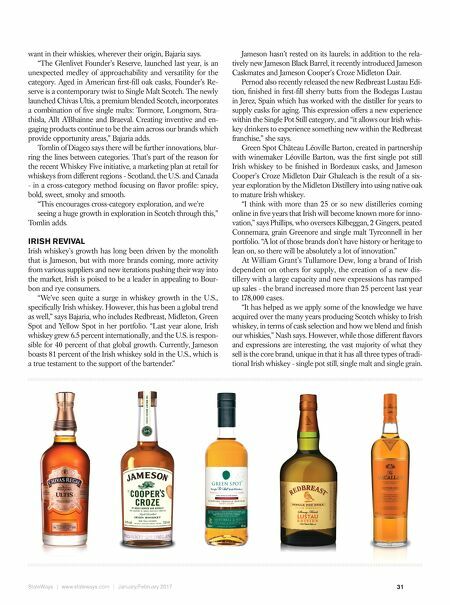 StateWays | www.stateways.com | January/February 2017 31 want in their whiskies, wherever their origin, Bajaria says. "The Glenlivet Founder's Reserve, launched last year, is an unexpected medley of approachability and versatility for the category. Aged in American fi rst-fi ll oak casks, Founder's Re- serve is a contemporary twist to Single Malt Scotch. The newly launched Chivas Ultis, a premium blended Scotch, incorporates a combination of fi ve single malts: Tormore, Longmorn, Stra- thisla, Allt A'Bhainne and Braeval. Creating inventive and en- gaging products continue to be the aim across our brands which provide opportunity areas," Bajaria adds. Tomlin of Diageo says there will be further innovations, blur- ring the lines between categories. That's part of the reason for the recent Whiskey Five initiative, a marketing plan at retail for whiskeys from different regions - Scotland, the U.S. and Canada - in a cross-category method focusing on fl avor profi le: spicy, bold, sweet, smoky and smooth. "This encourages cross-category exploration, and we're seeing a huge growth in exploration in Scotch through this," Tomlin adds. IRISH REVIVAL Irish whiskey's growth has long been driven by the monolith that is Jameson, but with more brands coming, more activity from various suppliers and new iterations pushing their way into the market, Irish is poised to be a leader in appealing to Bour- bon and rye consumers. "We've seen quite a surge in whiskey growth in the U.S., specifi cally Irish whiskey. However, this has been a global trend as well," says Bajaria, who includes Redbreast, Midleton, Green Spot and Yellow Spot in her portfolio. "Last year alone, Irish whiskey grew 6.5 percent internationally, and the U.S. is respon- sible for 40 percent of that global growth. Currently, Jameson boasts 81 percent of the Irish whiskey sold in the U.S., which is a true testament to the support of the bartender." Jameson hasn't rested on its laurels; in addition to the rela- tively new Jameson Black Barrel, it recently introduced Jameson Caskmates and Jameson Cooper's Croze Midleton Dair. Pernod also recently released the new Redbreast Lustau Edi- tion, fi nished in fi rst-fi ll sherry butts from the Bodegas Lustau in Jerez, Spain which has worked with the distiller for years to supply casks for aging. This expression offers a new experience within the Single Pot Still category, and "it allows our Irish whis- key drinkers to experience something new within the Redbreast franchise," she says. Green Spot Château Léoville Barton, created in partnership with winemaker Léoville Barton, was the fi rst single pot still Irish whiskey to be fi nished in Bordeaux casks, and Jameson Cooper's Croze Midleton Dair Ghaleach is the result of a six- year exploration by the Midleton Distillery into using native oak to mature Irish whiskey. 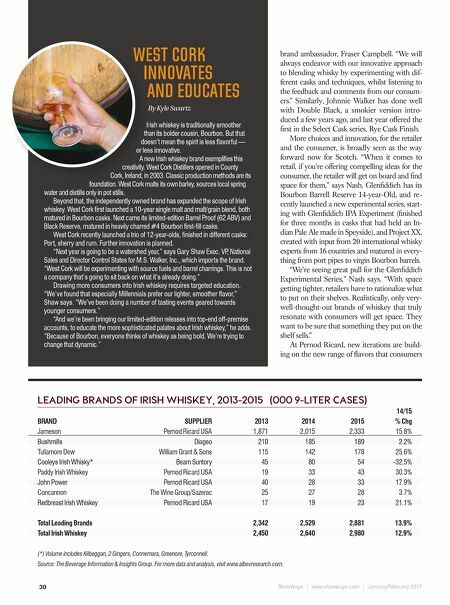 "I think with more than 25 or so new distilleries coming online in fi ve years that Irish will become known more for inno- vation," says Phillips, who oversees Kilbeggan, 2 Gingers, peated Connemara, grain Greenore and single malt Tyrconnell in her portfolio. "A lot of those brands don't have history or heritage to lean on, so there will be absolutely a lot of innovation." At William Grant's Tullamore Dew, long a brand of Irish dependent on others for supply, the creation of a new dis- tillery with a large capacity and new expressions has ramped up sales - the brand increased more than 25 percent last year to 178,000 cases. "It has helped as we apply some of the knowledge we have acquired over the many years producing Scotch whisky to Irish whiskey, in terms of cask selection and how we blend and fi nish our whiskies," Nash says. However, while those different fl avors and expressions are interesting, the vast majority of what they sell is the core brand, unique in that it has all three types of tradi- tional Irish whiskey - single pot still, single malt and single grain.